Colli Senesi wines - tasting tour with Tuscan Wine Tours. The first definition of a wine-area called Chianti was made in 1716. It described the area near the villages of Gaiole, Castellina and Radda, the so-called Lega del Chianti and later Provincia del Chianti. 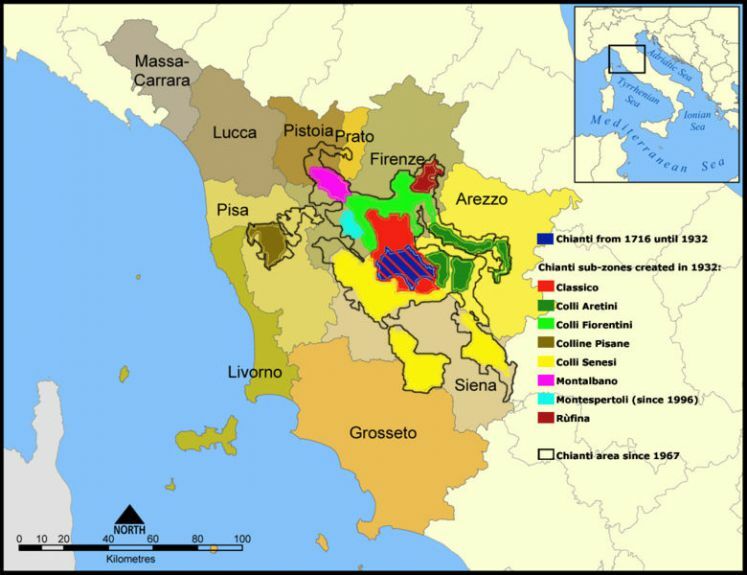 In 1932, the Chianti wine area was completely re-drawn and divided in seven sub-areas: Classico, Colli Aretini, Colli Fiorentini, Colline Pisane, Colli Senesi, Montalbano and Rùfina. In 1996 part of the Colli Fiorentini sub-area was renamed Montespertoli, making a total of eight subzones. The Chianti DOCG covers all the Chianti wine and includes a large stretch of land encompassing the western reaches of the province of Pisa near the coast of the Tyrrhenian Sea, the Florentine hills in the province of Florence to the north, to the province of Arezzo in the east and the Sienna hills to the south. Within these regions there are vineyards that overlap the DOCG regions of Brunello di Montalcino, Vino Nobile di Montepulciano and Vernaccia di San Gimignano. Any Sangiovese-based wine from these vineyards made according to the Chianti formula can be labeled as Chianti DOCG should the producer wish to use the designation. • Chianti Colli Fiorentini which is located south of the city of Florence. • Chianti Rùfina in the northeastern part of the zone located in the Val di Sieve, around the municipality of Rufina. • Chianti Classico in the centre of Chianti, between the cities of Florence and Sienna. • Chianti Colli Aretini in Arezzo province to the east. • Chianti Colli Senesi south of Chianti Classico in the Siennese hills. 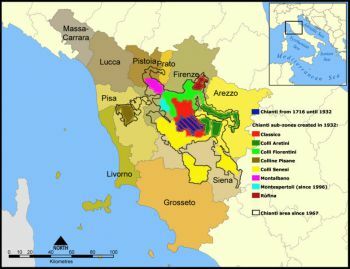 This is the largest of the sub-zones and includes the Brunello di Montalcino and Vino Nobile di Montepulciano areas. • Chianti Colline Pisane, the westernmost sub-zone in the province of Pisa. • Chianti Montespertoli is located within the Colli Fiorentini sub-zone, around the municipality of Montespertoli. 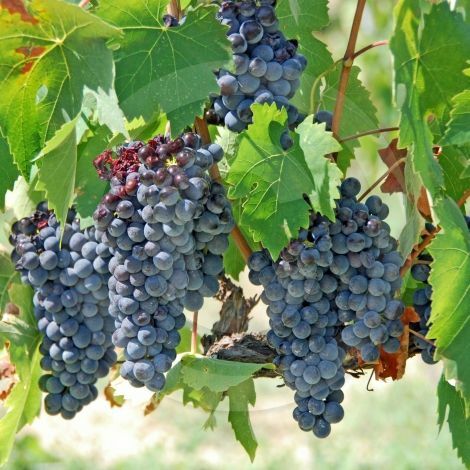 • Chianti Montalbano is in the northwest part of the zone which includes the Carmignano DOCG. There are an additional 10,324 hectares of vineyards in the peripheral areas that do not fall within one of the sub-zone classifications. Wines produced from these vineyards are simply labeled as "Chianti". Sangiovese grapes overwhelmingly dominate wine production throughout Tuscany, and Chianti is no exception. Since 1996, the ratio of grape varietals for Chianti and Chianti Classico wines has been 75-100% Sangiovese, up to 10% Canaiolo and up to 20% of any other approved red grape varietal such as Cabernet Sauvignon, Cabernet Franc, Merlot or Syrah. Since 2006, the use of white grape varieties such as Malvasia and Trebbiano have been prohibited in Chianti Classico. Chianti Classico must have a minimum alcohol level of at least 12% with a minimum of 7 months aging in oak, while Chianti Classico Riserva must be aged at least 27 months at the winery, with a minimum alcohol level of at least 12.5%. The harvest yields for Chianti Classico are restricted to no more than 3 tons per acre (7.5 tonnes/hectare). For standard Chianti, the minimum alcohol level is 11.5% with yields restricted to 4 tons per acre (9 tonnes/hectare). The aging for standard Chianti DOCG is much less stringent, with most varieties allowed to be released to the market on 1 March following the vintage year. The sub-zones of Colli Fiorentini, Montespertoli and Rufina must be aged for a further three months and not released until 1 June. All Chianti Classicos must be held back until 1 October in the year following the vintage. Many of the "Super-Tuscans" produced in Chianti are 100% Sangiovese.